What do you get if you combine the classic Brooks 'hammock' saddle design with thoroughly modern materials? You get the supremely comfortable Cambium C17. The Brooks England Way is to make a saddle by stretching a piece of good-quality cowhide across a metal frame so the rider sits on a slightly flexible platform that can move and conform. Over time, the leather wears in and shapes itself to the rider's bum, rather like a good pair of shoes. It's an approach that some swear by, guarding a prized, well-worn Brooks saddle as jealously as Gollum coveting the ring, and passing it on from bike to bike. But some find the wait for a Brooks to fit well is too long. In search of instant gratification of the ischial bones, they work their way through a succession of standard seats with plastic hulls, foam or gel padding and leather or microfiber covers, eventually ending up with saddles that more or less work. The Cambium is a third path to enlightenment. It has the same basic structure as a classic Brooks saddle, but instead of a sheet of leather across the ends of the rails, Brooks has come up with a combination of vulcanised natural rubber, cotton canvas and structural textile for the top. This top is inherently flexible, like a worn leather Brooks or a new one with the tension backed off slightly, and it moves slightly as you pedal. It supports you where you need it, and the movement helps prevent chafing. There's still a getting-used-to-it period as your bum adapts to the shape, but it's been very brief for me: a couple of 35km rides and I was completely comfortable after 100km in the saddle, buttocks cosseted by the Cambium's comfy hammock design. As well as the flexible, slightly stretchy rubber top, the Cambium provides its comfort by suspending you between the saddle ends. Regular saddles do this to an extent as well, but their rail ends are usually much closer together than the Cambium's, so you don't get as much of a suspension effect. But here, you have a real hammock effect and that makes the Cambium supremely comfortable, for me at least. After Sunday's 100km ride, the rest of me was trashed after the inevitable final scamper back into town, but my bum was completely comfortable. It's quite a wide saddle, significantly broader than my previous favourite, stablemate fizik's Aliante. I'm surprised to say that didn't matter. I'd like to try the narrower version, the C15, that Brooks has in the works, but I suspect that the ability of the Cambium to move with you means width — or rather narrowness — is less important. 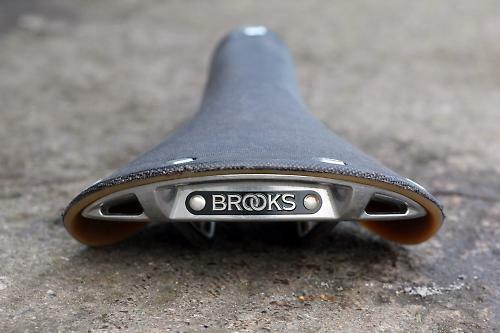 The Cambium not quite the first non-leather hammock saddle from the family of companies of which Brooks is part. Parent Selle Royal also owns fizik and there's a conceptual relationship between classic Brooks saddles and fizik's Kurve saddles. You can tweak the comfort of a Kurve by changing the hull tension, for example, and the rail attachment points are a long way apart. But where fizik went high-tech with the Kurve, with lots of carbon fiber and other clever composites, the Cambium is much more down to earth and has an artisanal beauty. The cast aluminium ends are pleasingly curved and the top has a hand-crafted look, even though it must be moulded. It's a lovely thing, and not at all out of place on a high-end bike. This isn't a saddle for weight-weenies though. At 418g it's probably the heaviest saddle with a three-figure price tag aside from classic Brooks or similar leather seats. Even the Brooks Swallow Classic titanium at 360g is lighter, though that saddle's titanium hardware does mean it's also eye-wateringly expensive. At £105 the Cambium is right in the ballpark of high-end saddles as far as price goes, and you can see where the money's gone. Real world longevity remains a question mark, but only because I don't yet have thousands and thousands of kilometres on my Cambium. I've no reason to think it won't be extremely durable. If it does get damaged, you can replace the rails, the nose and back pieces or the top by simply undoing the Torx screws that hold it all together. The bottom line (sorry) is that this is the most immediately and enduringly comfortable saddle I've ever used. If you value comfort over weight, then the Brooks Cambium C17 should be on your list of saddles you must try, and soon. Wonderfully comfortable fusion of classic ideas and modern materials. Brooks Cambium is a range of saddles made from vulcanized natural rubber and organic cotton canvas enhanced by a thin layer of structural textile for added resilience and legendary Brooks longevity. The uniquely flexible, maintenance-free, waterproof top is designed to follow the rider's movements to deliver immediate comfort and ease of use. Unarguably heavy compared to other £100 saddles, but that's not the point. The most comfortable saddle I've used. I had high expectations, given the hype; the Cambium lived up to them. The comfort, the construction, the repairability. It would be nice if it were lighter. Brooks is rumoured to be working on a lighter version. Only the weight stops me from awarding this saddle full marks. Brooks says: The new construction of Cambium Saddles works like a hammock and delivers immediate comfort while absorbing vibration and shock, performance traditionally found only with natural leather saddles. This saddle is assembled from replaceable parts and requires no special tools for servicing. The vulcanized rubber top is practically indestructible; should your Cambium frame suffer an unfortunate accident, repairs can be quickly and easily accomplished by you or your trusted Brooks Dealer of Excellence. Is it 'grippy'? I've never really got on with non-leather saddles because I like to slide about a lot when I change position, and plastic saddles just don't let you do that like a leather one. How does this one compare? all said and done I love mine, just wish it didn't weigh a ton !! Any comment about water resistance? Or would it be best to await an update after the usual 'dry' British Summer? Are these available in more than one colour? I liked the original natural canvas colour, but I like this colour even more, is it the charcoal grey it seems to be in the picture in real life? And does anyone know of when the C15 is due out? Had a look at one of these in the LBS; very nice, although with an Imperial on my Hybrid/commuter and a Swift on the road bike, I'm already a fan. LBS's opinion was it was OK to get it wet, although the leather ones don't seem to suffer after an unintentional 'wetting'. I was on the road bike in France and the Swift got a very approving nod from an elderly local. Having fondled one, I can't help thinking that it would be a bit abrasive and you might start wearing through Lycra rather quickly. And yes... pretty heavy. And for those of us with soft parts, surely your hard parts work their way into the saddle leaving your soft parts to sit on the saddle? I bought a brooks roll up pannier bag in June last year. Excellent for the shops and commuting if no laptop is involved. Expensive bag, but one of the pins that keeps the bag in a roll up position came loose and got lost. I have now sent two emails one on their website and one directly to their customer services asking for a replacement pin that can at worst cost them 60p. After 5 days I am yet to receive a response or an acknowledgement of my request.I considered that saddle but given the premium prices they are asking I would have expected a better or more helpful customer service. I will see how I get on but for now that saddle is no longer a consideration for me. 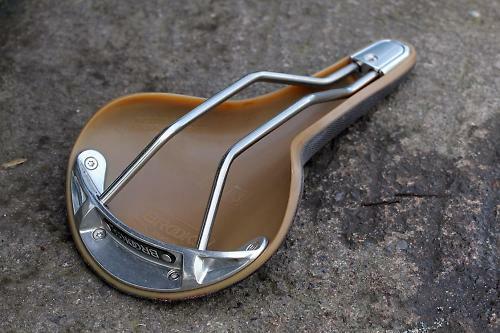 I tried one recently on a regular route - it wasn't comfortable for me - I found it transmitted a lot of road vibration which my normal saddle - a Selle Anatomica - simply absorbs somehow. Perhaps the aluminium frame contributes to that. It's available in natural and slate coloured canvas finish. Reviewing saddle comfort strikes me as a ridiculously subjective thing to do. About as useful as arguing about which is the best colour. I do like the idea of a Brooks that doesn't look out of place on modern carbon bikes, though. I have a B17 on my Brompton and love it but think they look a bit silly on more state-of-the-art machines. To be fair to their customer service they eventually replied after 3rd email and sorted me out. Put the Carved version of this on a aluminium hybrid/commuter; not comfortable and had sore 'sit bones' due to feeling every bump in the road. Popped it on a steel road bike (regular saddle broke) and it was very comfortable. Would have chosen a C15 for a road bike but I think I suit something a bit wider.